*UCI pro races all have a ranking system for their “prestige”. The higher the ranking, the more money the promoter pays and the more payout there is for the elite riders. In cross, a Category 1 (C1) carries more weight and series points, than a Category 2 (C2). As a result, top riders such as Jeremy Powers, target C1 events in order to gain more points which equates to a better ranking and a better call-up to the start line. 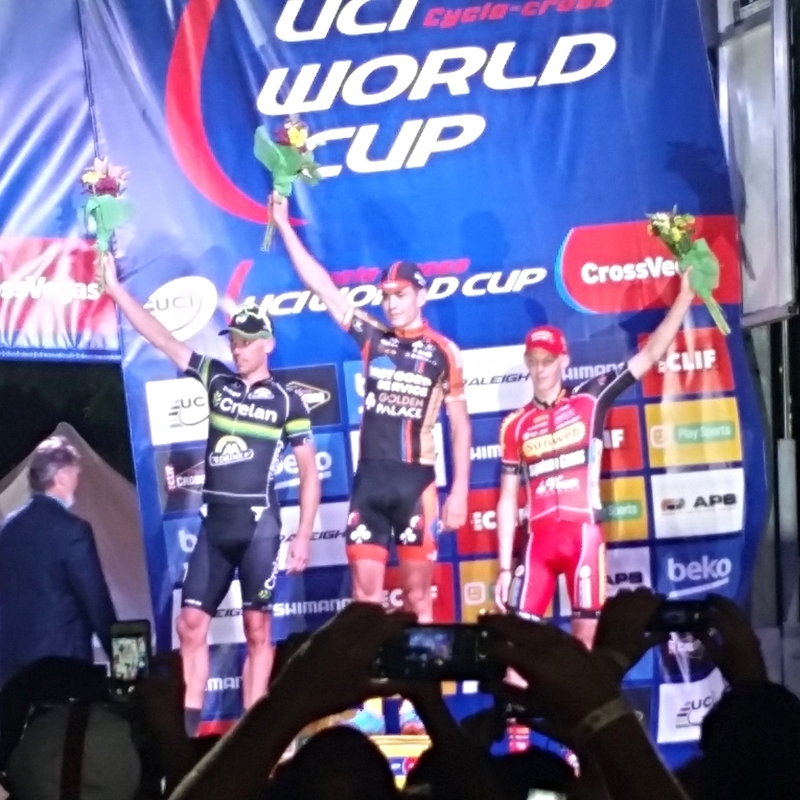 **In cycling, the World Cup series is an elite level series in all disciplines for both men and women. Riders accumulate points at each race and these points go towards sorting out an overall winner at the end of the year. Until last year, the cyclocross World Cups had all been contested in continental Europe. The World Cup in Milton-Keynes, England was the first event to be held off the mainland and has since opened the door for further growth and expansion into other countries. 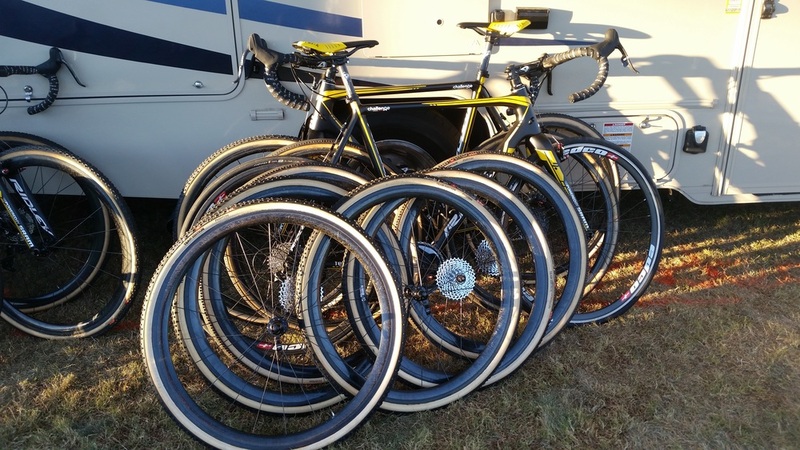 On paper, the start of the 2015-2016 cyclocross schedule doesn’t look too out of the ordinary. 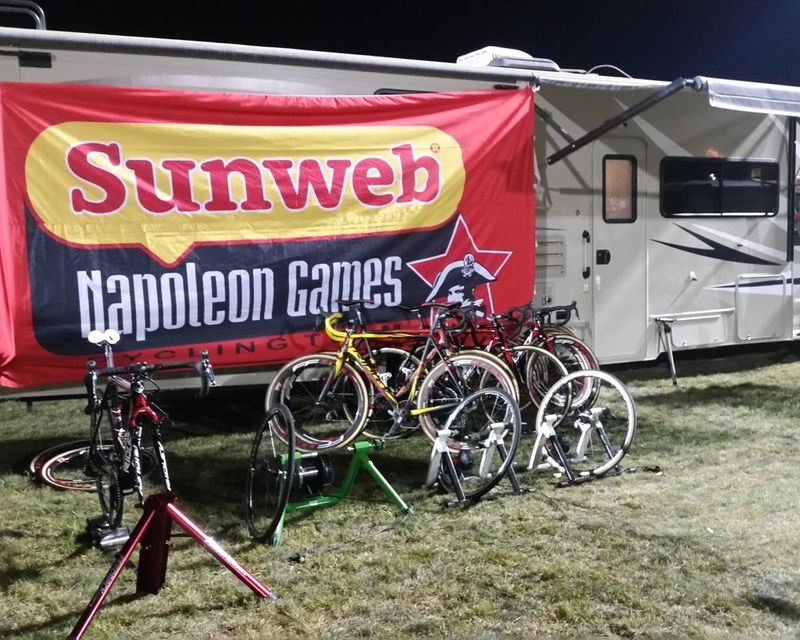 There are a couple early season races (Full Moon Vista and Nittany CX) and then things really heat up at Cross Vegas (CX Vegas). In recent years, this Category 1 race* has started to gain more notoriety as it coincides with the annual Interbike trade show. The attraction of Interbike and the benefits of early season racing, have led a few of the European pros make the hop across the pond before the racing kicks off in Europe. 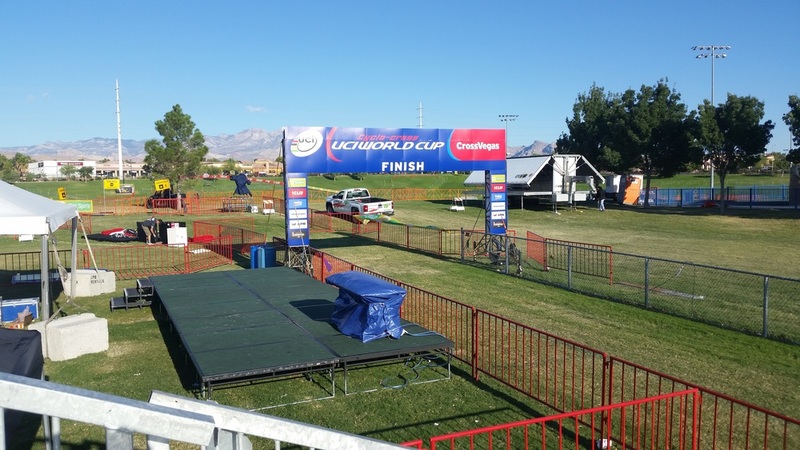 But in 2015, Cross Vegas has transformed into a whole different animal as it became the first race on the World Cup schedule**. Being a World Cup event is a win in and of itself, but having the distinction of being the first ever World Cup outside of Europe and the first ever on North American soil made the bright lights of Desert Breeze Soccer Complex shine even brighter. Early in the year I made a plan to fly out to the race to kick off my own cyclocross season. But once it was announced that CX Vegas would be a World Cup, my plans changed a bit and I decided to volunteer instead. Not a bad way to spend my first trip to Vegas! No gambling this time around though. Off to the FIRST World Cup in America! The day started early on Wednesday with an early dawn wake up call and a quick bite to eat before heading to the venue. By all outward appearances, it was a normal weekday at the park. Our crew of volunteers worked to put the finishing touches on the course, the final primping before the big show. Hammer stakes, throw some tape up, move this table, set up that banner. 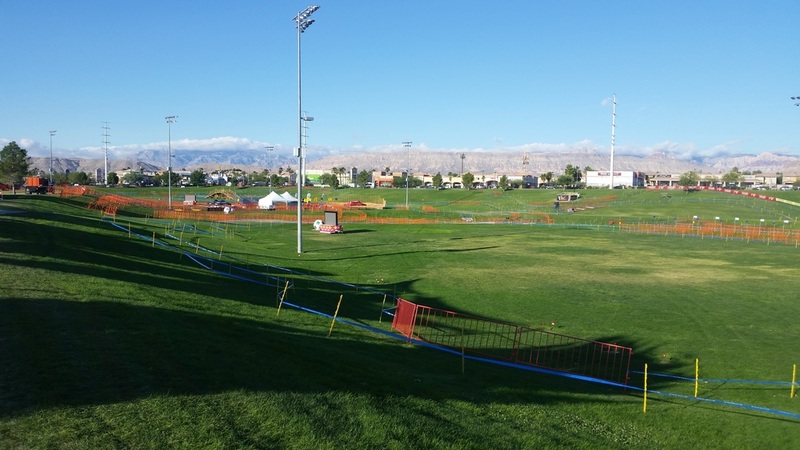 Cross Vegas was coming together right before our eyes, howling wind be damned. As we toiled away around the park, the presence of the world’s top riders served as a reminder that this wasn’t an ordinary Wednesday. Meredith Miller, Allen Krughoff, Jeremy Powers, Katie Compton, Gabby & Jeremy Durrin, Curtis White were all in attendance along with the reigning Belgian champ Sanne Cant, Ellen van Loy, the BKCP team, and other top pros I’ve only seen on TV. As it got closer to show time, my level of bike-nerd increased exponentially. “That’s Klaas Vantornout!” I said to someone standing next to me. Yea, Fanboy Level 11 = Achieved. Being so close to riders who, to me, represent the highest level of the sport was something to behold – as was the amount of preparation they put in. Pedestal aside, I was giddy with excitement being in close proximity with the Euros. Both the USAC and Wheelers & Dealers race heightened the excitement and by the time the women’s elite race kicked off, the park that was empty just 12 hours before was now jammed with spectators and fans. A true spectacle indeed! The racing didn’t disappoint either! After all is was the whole reason people came to Las Vegas, right?! The women’s race was a tightly contested battle that went to the last lap, where Katarina Nash broke away from the elite group of leaders to win yet another CX Vegas title. The men’s race was equally exciting, as Sven Nys took to the line for the last time in America. Having won the past two editions, everyone, including myself, was hoping to see a three-peat by the ‘Cannibal from Baal’ as he enters his final season. It looked for a moment that he had a shot, as Nys and wunderkid Wout van Aert set off in a two-man time trial to catch the reigning U23 World Champ, Michael Vanthourenhout. The trio of riders rode together until the penultimate lap, when Wout van Aert attacked on the hardest part of the course, a series of slow, steep climbs on the back section of the course. Nys responded as best as he could, but van Aert’s attack was too much for Nys, ensuring the yound Belgian the top spot on the podium, the World Cup leader’s jersey, and a nice birthday present to boot. I should also mention that the U.S. had its best showing in a World Cup ever! Jeremy Powers finished 6th, besting some of the top riders in the world, while Ryan Trebon (12th) and Curtis White (20th) were also in the Top 20. Race over and podium complete, it was time for me to head to the airport to catch the redeye flight back to Dallas and back to reality. Even though I was on the struggle bus all day on Thursday, being a part of the first World Cup in America was a truly awesome experience! 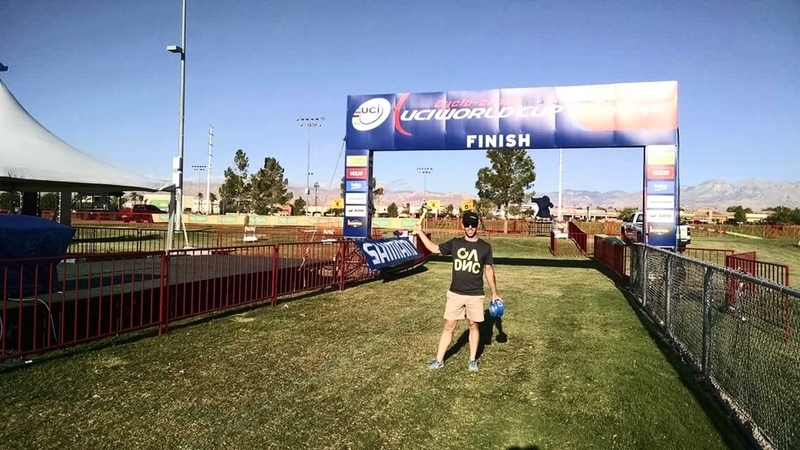 If you have the chance to go next year, make it a plan to head out to the desert and don’t forget that these races that grow cyclocross, and cycling as whole, in the U.S. are not possible without the help of volunteers!